We regret to have to inform Members that Bette Hill passed away last Friday at the age of 91. She held the unique distinction of being wife and mother of Formula 1 World Champions. It was through a common involvement in rowing that she first met Graham in 1950 at a Boxing Day regatta but, by the time they married in 1955, Graham was already set on his career as a racing driver while maintaining his rowing links by carrying the colours of the London Rowing Club on his crash helmet. 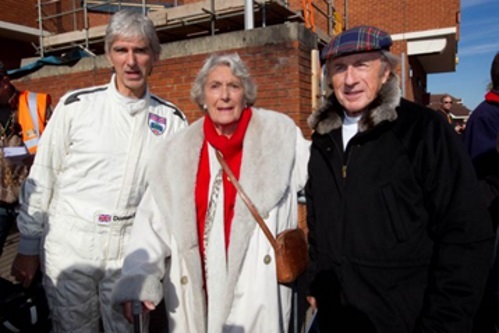 Their honeymoon was in Bognor Regis so that Graham could drive for Lotus in the Goodwood Nine Hours just up the road. Throughout Graham’s career, Bette was a familiar figure in the paddock and in the pits. In the days before electronic timekeeping she was invariably to be seen armed with stop watches and a clip board faithfully recording every race. In 1962 she was one of the founder members, along with the wives and girlfriends of other prominent motor racing personalities, of what is now the Doghouse WMRAC and was one of the prime movers behind the annual, charitable fund-raising, Doghouse Ball which became one of the highlights of the motor racing social scene. Having won F1 World Championships in 1962 and 1968, Graham went on to establish his own F1 team before losing his life in the disastrous flying accident in 1975. The ramifications of the accident meant that Bette and her three children Brigitte, Damon and Samantha, subsequently had to endure a very different way of life for many years. When, some 10 years later, Damon embarked on his racing career, Bette was there to support him from Formula Ford all the way to his F1 World Championship in 1996. The BRDC, of which Bette was elected an Honorary Member in 1980, offers its most sincere condolences to Brigitte, Damon and Samantha and their families.